A compass needle is a small bar magnet. When it is brought near a bar magnet, its magnetic field lines interact with that of the bar magnet. Hence, a compass needle shows a deflection when brought near a bar magnet. Concept Insight: Magnetic fields interact with each other. Interaction of magnetic field of earth and that of the compass needle is used to find directions. Concept Insight:- Note that magnetic field lines never intersect each other. 1. Outside a magnet, magnetic field lines are directed from North pole to South pole. 2. The direction of field lines inside the magnet is from the South pole to the North pole. 3. 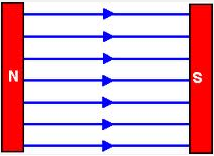 Magnetic lines do not intersect with each other. 4. Magnetic lines of force are crowded near the poles of a magnet but they are widely separated at other places. If two field lines of a magnet intersect, then at the point of intersection, there would be two directions of magnetic field. This is not possible. Hence, two field lines do not intersect each other. For right side of the circular loop, the direction of magnetic field lines will be as if they are emerging from the table outside the loop and merging in the table inside the loop. Similarly, for left side of the circular loop, the direction of magnetic field lines will be as if they are emerging from the table outside the loop and merging in the table inside the loop, as shown in the given figure. Concept Insight: The uniform magnetic field is represented by parallel and equidistant magnetic field lines. The magnetic field inside a long, straight, current-carrying solenoid is uniform. It is the same at all points inside the solenoid. When a proton enters in a region of magnetic field, it experiences a magnetic force. As a result of the force, the path of the proton becomes circular. So, its velocity and hence momentum change. The direction of the magnetic field can be determined by the Fleming's left hand rule. Concept Insight:- According to Fleming's left hand rule, if we arrange the thumb, the central finger, and the forefinger of the left hand at right angles to each other and if the forefinger points in the direction of magnetic field, the central finger points in the direction of current, then the thumb points in the direction of motion of the conductor. Since the direction of positively charged alpha particle is towards west, the direction of current will be the same i.e., towards west. Again, the direction of magnetic force is towards north. Hence, according to Fleming's left hand rule, the direction of magnetic field will be upwards. According to Fleming's left hand rule, if we arrange the thumb, the central finger, and the forefinger of the left hand at right angles to each other and if the forefinger points in the direction of magnetic field, the central finger points in the direction of current, then the thumb points in the direction of motion or the force acting on the conductor. The working principle of an electric motor is based on the magnetic effect of current. A current-carrying loop experiences a force and rotates when placed in a magnetic field. The direction of rotation of the loop is given by the Fleming's left-hand rule. 1. Induce current on a coil by moving the coil in a magnetic field. 2. Induce current on a coil by changing the magnetic field across it. 3. If a coil is moved rapidly between the two poles of a horse-shoe magnet, then an electric current is induced in the coil. Concept Insight:- An electric generator works on the principle of electromagnetic induction. It generates electricity by rotating a coil in a magnetic field. Concept Insight:- Some sources of direct current are cell, DC generator, etc. Concept Insight:- AC generators, power plants, etc., produce alternating current. Concept Insight:- The commutator reverses the direction of current flowing through the coil after each half rotation of the coil. Concept Insight:- Safety measures like fuse and earthing are very necessary in case of electrical circuits and appliances as an electric shock may prove to be deadly. Concept Insight:- The magnetic field lines, produced around a straight current-carrying conductor, are concentric circles. Their centres lie on the wire. Concept Insight:- When a coil and a magnet are moved relative to each other, a current is induced in the coil. This phenomenon is known as electromagnetic induction. Concept Insight:- An electric generator produces electric current. It converts mechanical energy into electricity. Concept Insight:- An AC generator has two rings called slip rings. A DC generator has two half rings called commutator. This is the main difference between both the types of generators. Concept Insight:- When two naked wires of an electric circuit touch each other, the amount of current that is flowing in the circuit increases abruptly. This causes short-circuit. Concept Insight:- An electric motor converts electrical energy into mechanical energy. Concept Insight:- A generator is an electric device that generates electricity by rotating a coil in a magnetic field. It works on the principle of electromagnetic induction. Concept Insight:- A long circular coil is a long solenoid. The magnetic field lines inside the solenoid are parallel lines. Concept Insight:- Live wire has red insulation cover, whereas earth wire has green insulation colour in the domestic circuits. A solenoid is a long coil of circular loops of insulated copper wire. Magnetic field is produced around the solenoid when a current is allowed to flow through it. The magnetic field produced by it is similar to the magnetic field of a bar magnet. 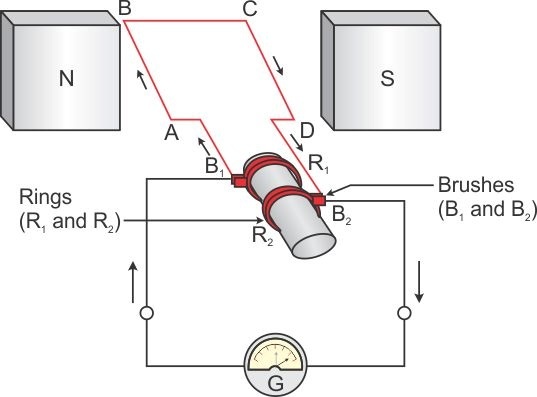 The field lines produced in a current-carrying solenoid is shown in the following figure. The direction of magnetic field is given by Fleming's left hand rule. Magnetic field inside the chamber will be perpendicular to the direction of current (opposite to the direction of electron) and direction of deflection/force i.e., either upward or downward. The direction of current is from the front wall to the back wall because negatively charged electrons are moving from back wall to the front wall. The direction of magnetic force is rightward. Hence, using Fleming's left hand rule, it can be concluded that the direction of magnetic field inside the chamber is downward. When a current is allowed to flow through the coil MNST by closing the switch, the coil starts rotating clockwise. This happens because an inward force acts on length MN and at the same time, an outward force acts on length ST. As a result, the coil rotates clockwise. Current in the length MN flows from M to N and the magnetic field acts from left to right, normal to length MN. Therefore, according to Fleming’s left hand rule, an inward force acts on the length MN. Similarly, current in the length ST flows from S to T and the magnetic field acts from left to right, normal to the flow of current. Therefore, an outward force acts on the length ST. These two forces cause the coil to rotate clockwise. Concept Insight:- A current induces in a coil if a bar magnet is moved relative to it. This is the principle of electromagnetic induction. Concept Insight:- In electromagnetic induction the change in magnetic field induces a current in the conductor. An electric generator consists of a rotating rectangular coil placed between the two poles of a permanent magnet. The two rings R1 and R2 are internally attached to an axle. The axle may be mechanically rotated from outside to rotate the coil inside the magnetic field. Outer ends of the two brushes B1 and B2 are connected to the galvanometer to show the flow of current in the given external circuit. When the axle is rotated, arm AB moves up (and the arm CD moves down) in the magnetic field produced by the permanent magnet. Let us say that the coil ABCD is rotated clockwise. By applying Fleming’s right-hand rule, the induced currents are set up in these arms along the directions AB and CD. Thus, an induced current flows in the direction ABCD. If there are more turns in the coil, the current generated in each turn adds up to give a large current through the coil. After half rotation, CD and AB reverse direction, and thus, CD starts moving up and AB starts moving down. As a result, the directions of the induced currents in both the arms change. Such a current which changes direction after equal intervals of time is called an alternating current. Thus, this device is called an AC generator. To get a direct current, a split-ring type commutator must be used. The generator is thus called a DC generator. The difference between direct and alternating currents is that the direct current always flows in one direction, whereas the alternating current reverses its direction periodically. An electric short circuit occurs when the live wire and the neutral wire come in direct contact. This happens when the plastic insulation of live wire and neutral wire gets torn or when there is a fault in the electrical appliance.